With most of its IPs sold, its development houses auctioned off, and the company in the aftermath of bankruptcy, THQ is gone. While companies shutting their doors is always a somber moment, we as gamers can hold out hope that the developers formerly of THQ will find work and continue making great, quality video games for us to enjoy for many more generations. Most all the talk in the game news media this week has centered around THQ, which got me thinking about the company and its games. For a company that has gone away, they sure had a hell of a lot of great and memorable games! I started playing video games on the Nintendo Entertainment System way back in the early 90s. I remembering growing up with the likes of Mega Man, Mario, and Spider-Man. Like nearly every male child growing up in the 90s, I started watching professional wrestling, in particular WWF. Shawn Michaels was the man (and still is, in my wrestling book), and there was no better way to spend a Monday night. Around that time there was a major competitor to the WWF. The WCW was an alternative wrestling federation, featuring different wrestlers and what-not, but my child-mind only saw it as a rip-off of the WWF. 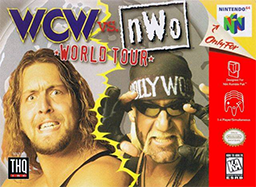 It wasn’t until THQ graced us with the gem that is WCW vs. nWo: World Tour that I started to look differently at the world of pro wrestling. Certainly not THQs first game, it was however the first game by the company that I can remember playing. Exclusive to the Nintendo 64, WCW vs. nWo was a brilliant approach to pro wrestling video games. The animation was smooth, the gameplay was damn near perfect, the moves were authentic, and the game had all the charm you’d see in pro wrestling (ie: chairs to the face). Arguably the best feature of the game though was the inclusion of up to four player multiplayer bedlams. Having two older brothers who also watched WWF/WCW, it was easy for all of us to agree on playing a game. In fact, it’s the ONLY time I can recall all of us playing a game together so frequently. WCW vs. nWo was quickly followed by a much better game, WCW/nWo: Revenge, which featured more modes, characters, and better gameplay. But it was still missing one key component that THQ would deliver on with its next release. Finally… THE ROCK HAS COME BACK TO THE NINTENDO 64!! Wrestlemania 2000 had everything the WCW games had, just with all the Superstars I was familiar with. 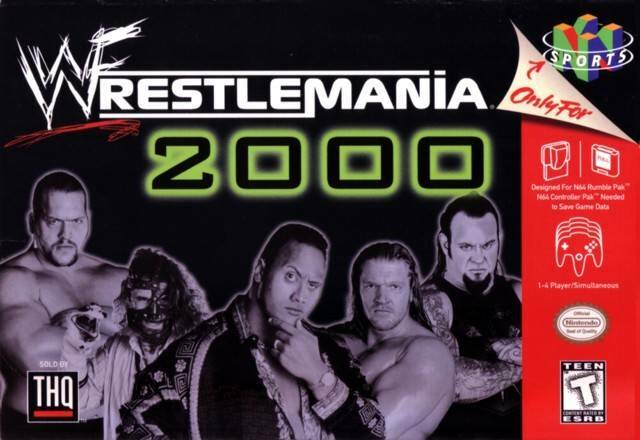 Retaining the fantastic multiplayer component and expanding on the already superb gameplay, Wrestlemania 2000 was a masterpiece. Extending the longevity of the game was the inclusion of a very expansive create-a-wrestler mode. With tons of costumes to use and moves to assign, creating a wrestler made it easier for us to update the game with the current Superstars appearing on TV. My brothers and I spend countless hours updating rosters, tweaking appearances, and discovering hidden in-game costumes that resembled actual past pro wrestlers. It wasn’t until THQ’s release of WWF: No Mercy in 2000 that we every switched this game out. No Mercy was and still is in my opinion, the greatest wrestling game every made. Sadly, this was the last game THQ released under the WWF license that was memorable, as newer games strayed away from this formula. 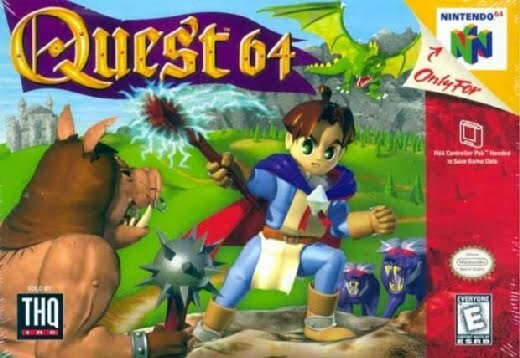 Between wrestling adventures, THQ released a nice little RPG on the Nintendo 64, so wittingly named Quest 64. A simple action RPG with then-stunning graphics, Quest 64 never got as much love as it deserved, but it got a bunch of love from me. My friend had the game, so I could only play his copy when I was allowed to borrow it, and I fell in love with the concept of the RPG. I was hooked the first time I leveled up and realized the more I played the game the stronger/better I got. Though it wasn’t the first RPG I recall playing, it was certainly one of the most memorable. THQ publishing house Volition released a slew of other RPGs that, while not up to par with other RPGs, were games I still played and enjoyed. Summoner for the PS2 was a very early PS2 game and looked it, but it was an action RPG like Quest, so I had a thing for it right from the beginning. Sadly, THQ’s follow-up of sorts to Quest on the N64 was the not-so-great Aidyn Chronicles: The First Mage. The marketing campaign behind this game must have been entirely with Toys ‘R Us, because I can still recite the stupid attract mode trailer for the game in my head hearing it so much at the store (which both my brothers and my dad happened to work at!). 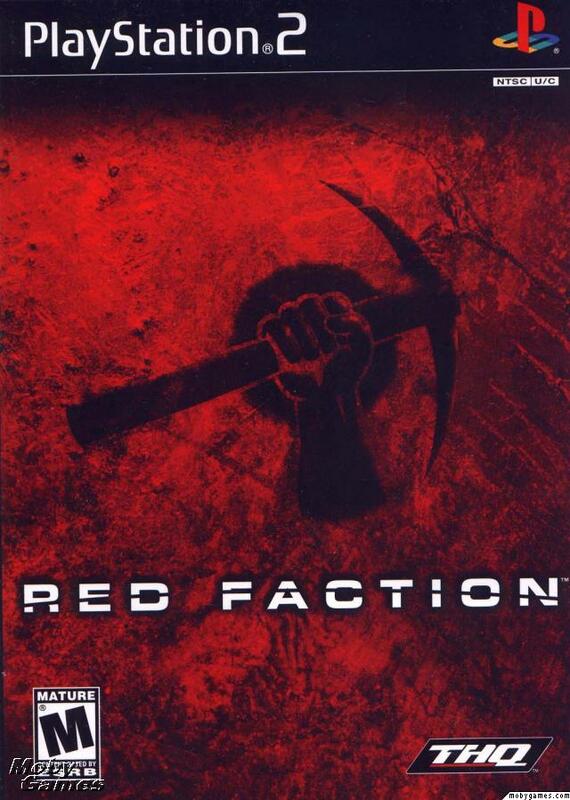 Though I never got to play the series until much later, in 2001 THQ released the very first Red Faction game, which would go on to be a major franchise for the company. It wouldn’t be until 2005 that I decided to pick up and play Alter Echo, a game that by most accounts no one has ever heard of. It’s a generic action adventure game set in a futuristic world, but for this reason or that the game clicked with me and I saw it to completion. I think it was the story and world design that permeated with me, as I thought the sci-fi setting was great. I’m sure it’s only a few bucks nowadays, so I’d say give it a shot if you can. It’s around mid-2000 that I think THQ really started to go south, at least with games that interested me. Like I said, there were no longer any worthwhile wrestling games out there, and the thoughts of seeing THQ Man and AKI Man duke it out in HD was waning. 2005’s release of Destroy All Humans! and the Warhammer series of RTS games were the only games I recalled enjoying by the company up until the closing. Warhammer: Dawn of War is as good as WarCraft and was severely under appreciated, while Destroy All Humans! was well received but didn’t last long as a franchise. 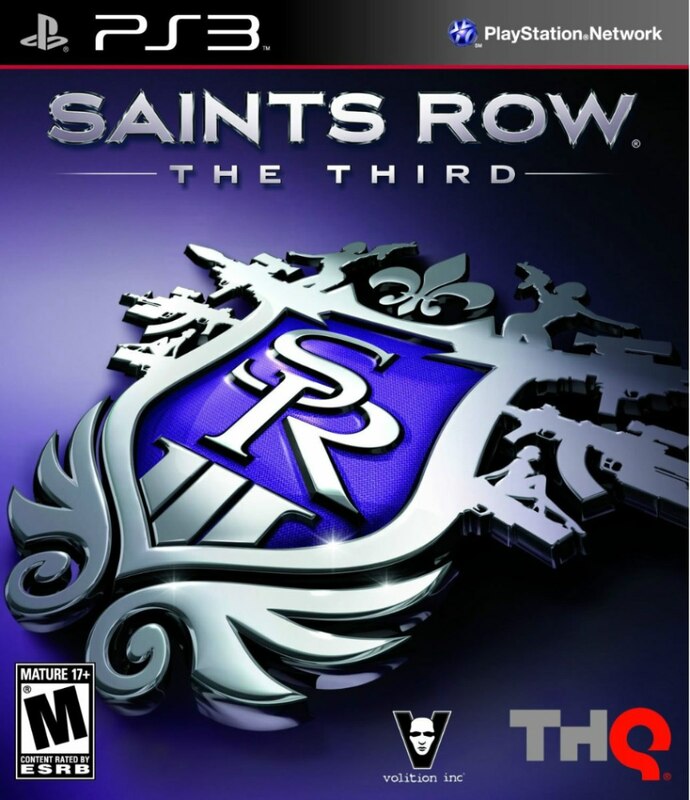 I began to associate THQ with licensed games and other shovelware that I would never play or enjoy. And then THQ was gone. I know I’m leaving out huge game series’ like Company of Heroes, Saints Row, and the newer WWE games, but these weren’t games I played. They weren’t games I recall fondly and can tell you stories about playing. With the exception of Darksiders, there wasn’t a single THQ game I can say I know is by THQ that I played. The company was in its downward spiral, and unfortunately the end was looming. But this isn’t supposed to be an article about why the company had to shut down, it’s an article celebrating the great times that I’ve had with its games. I mean it when I say the Nintendo 64 wrestling games are some of my favorite games of all time. I have countless cherished memories from that generation thanks to THQ. I owe a good part of my love affair with RPGs thanks to Quest 64, something I am eternally grateful for since it turned me on to so many other classic games. While the company is gone, the legacy it leaves behind is still present, and if anything it’ll burn brighter than ever. Thank you, THQ, for providing me with truly awesome video games growing up. Great tribute, man. My fondest memories of THQ are the same — those old wrestling games were so much fun! I was late to getting a Nintendo 64, but I got hooked on No Mercy and the WCW games right away. I haven’t played any wrestling games since the PS2 era, but it sounds like the THQ games are still the best of the genre. I dabbled in the GameCube/PS1/PS2 wrestling games following the N64 era, and they were no where near the same quality at THQ’s originals. Sadly it looks like the only time I’ll be able to re-live those old glory days of wrestling games is by breaking out the 64 and playing them on that system. Wait, what am I saying? That sounds awesome!